Following in the footsteps of Polar and Sony, Garmin has upgraded its vívosmart fitness tracker with a built-in heart optical rate monitor. At the cost of a tiny hit in battery life, the new vívosmart HR means there’s one less accessory to bring with you on a run. But in addition to letting you leave your chest strap heart rate monitor at home (unless you prefer its accuracy) the new vívosmart HR also finally features a barometric altimeter on board. It not only makes it easier for the tracker’s sensors to estimate how many sets of stairs have been climbed, it gives the wearer “extra credit” for activities performed at a higher, more strenuous, altitude. 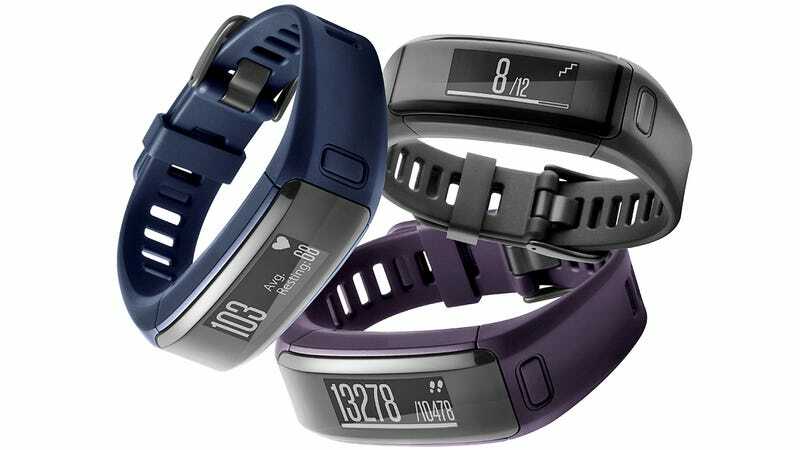 Everything else is pretty par for the course as far as fitness trackers go these days. The vívosmart HR’s always-on display lets the wearer keep tabs on steps taken, calories burned, distance traveled, heart rate, and even notifications when Bluetooth-connected to an iOS or Android smartphone app. The original vívosmart boasted a full seven days of battery life before needing a charge, and the vívosmart HR comes close to that with an estimated five days of runtime. Your mileage will certainly vary depending on how heavily you rely on that heart rate monitor, but it’s still a step above a smartwatch that needs to be topped off every night. The vívosmart HR bests smartwatches when it comes to price too, selling for $150 when it officially hits stores next week.